There is a tower which howls to the three moons each darkening dusk to golden dawn. It howls its defiance, a paean of demonic prowess with lost souls, pain and damnation as choir. Adventurers occasionally dare its depths, but only at day. To hear its cries at night is to court madness, or worse. 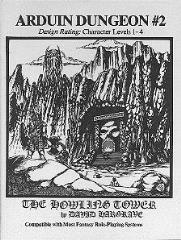 The Howling Tower is the second in a series of adventure modules based on the best selling Arduin Trilogy. The suggested level of play is 5-8 characters of 1st thru 4th level. It contains eight dungeon levels complete with maps and area descriptions, eight pocket sized magic artifact cards, and eight illustrated monster cards with statistics. While designed for use with the Arduin game system, The Howling Tower is usable with any d20 or other FRP system.